Cities are taking charge when it comes to their streets. A number of big American cities have come out with manuals and toolkits to guide their design. In the third part of their series on streets, Amber Hawkes and Georgia Sheridan look at some of the emerging street design manuals and how they're working. "It is all too easy to forget that streets are not just there to get people from A to B. In reality, streets have many other functions. They form vital components of residential areas and greatly affect the overall quality of life for local people." -- Manual for Streets, UK Department for Transport and Department for Communities and Local Government. As we've seen in our first two articles in the series on Rethinking the Street Space, cities are taking steps forward to re-evaluate both the form and function of their "street spaces" – understanding that the design and quality of public space affects its use, investment, and the overall Livability of their communities. Over the past decade, Seattle (2005), Los Angeles (2008), New York (2009), San Francisco (Draft, 2008), and several other cities and non-profit groups across the U.S. have released new street design manuals and toolkits. In this 3rd article, we give an overview of a growing number of new street design manuals, comparing goals, policy priorities, design elements, and implementation strategies from a range of cities, nonprofit organizations, and national agencies. What are the Goals of the Manuals? 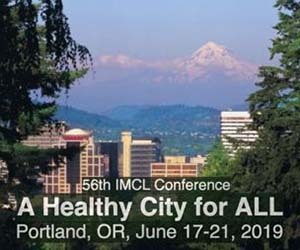 Livability and Placemaking. Making streets places to linger and places to cherish. Access and Mobility: Improving the public right-of-way for all users. Pedestrian and Bicyclist Safety: Supporting design improvements such as raised crosswalks, bulbouts, bike lanes, and roundabouts that improve safety for pedestrians and bike riders. Flexibility: Giving designers choice, rather than a one-size-fits-all approach. Context: Designing streets based on their place within a hierarchy of streets and their relationship to surrounding land uses, densities, and commercial activities. Balance: Maintaining several functions in the street that include safety, roadway infrastructure, environmental sensitivity, and others. Healthy Environment: Minimizing negative environmental effects and creating places that encourage walking and exercise. Visual Excellence: Improving the overall aesthetic with an emphasis on high quality, lasting design and materials. The extent to which each manual prioritizes one goal over another depends on the agency that wrote it and their agenda. The Context Sensitive Solutions Manual -- produced by the Institute for Transportation Engineers and the Congress for the New Urbanism -- emphasizes roadway width, type, and circulation features and paints street design with a broad brush, because its audience is national rather than local. Alternatively, Community Design: A Toolkit for Building Physical Activity into Daily Life (PDF), focuses on street design methods that improve public health. The Metropolitan Design Center prepared this manual for the Blue Cross and Blue Shield of Minnesota Conference on Health Implications of Community Design. Most manuals begin with some sort of a mission statement setting a new agenda for street space as "a great public resource," (Seattle, Right-of-Way Improvements Manual) to be enhanced. The manuals of New York, Chicago , and San Francisco all begin with bold letters from their mayors, articulating the importance of streets as dynamic places whose "character and uses can change as the City continually evolves and reinvents itself" (Mayor Michael Bloomberg, New York, Street Design Manual). Strong leadership (Bloomberg, San Francisco Mayor Gavin Newsom, Seattle Mayor Greg Nickels, Chicago Mayor Richard Daley) is a must for a successful manual. Without leadership, the manuals lack political authority to fulfill their mission statements. 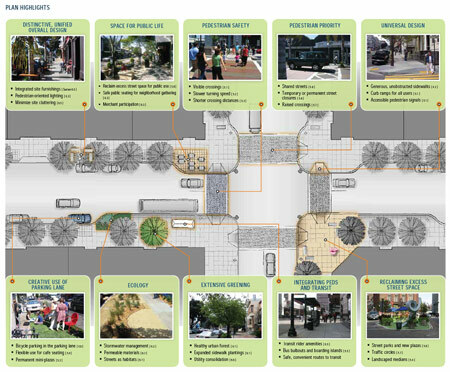 Page from the "San Francisco Better Streets Plan", which outlines goals graphically, using images of desirable design elements found in the street space. In addition to shared goals, the manuals take an interdisciplinary approach to planning and design, bringing various decision-makers to the table, from the conceptual planning phase all the way through plan adoption, implementation, and subsequent modification. As San Francisco's Better Streets PlanProject Manager Adam Varat describes, working with inter-disciplinary and inter-departmental groups takes time and requires new models of integrated policy-making in a bureaucracy used to operating in separate silos. It also requires a system for integrating public input from a wide range of stakeholders. San Francisco's Draft Plan, currently under public review, has passed through 75 community meetings, monthly Community Advisory Committee meetings, more than 50 interviews with various City departments to gather comments. It has also received more than 1,000 responses to two surveys of the public. 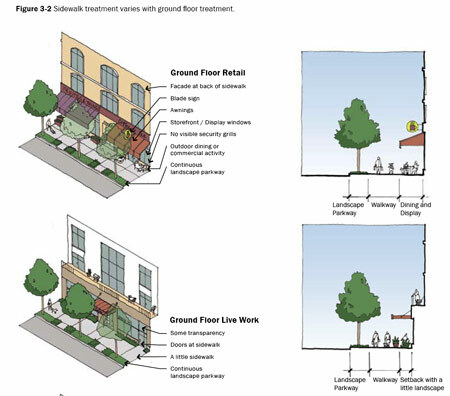 Image from Los Angeles' "Downtown Urban Design Guidelines". The Plan places special emphasis on the area where the sidewalk meets the building edge to create a high quality public realm. The City of Los Angeles, perhaps one of the cities most "in need" of street design reform, has made significant strides in articulating the importance of urban design in the street space with a Walkability Checklist (2008), Downtown Urban Design Guidelines (2009), and City Urban Design Principles (2009), which prioritize the design of the sidewalk, street edge, and of the pedestrian experience, in general. However, without major political support, the City's efforts to rethink the street space will not have any real widespread regulatory power. Audience: For Whom Are They Intended? Intended users of the street design manuals include a variety of design professional (e.g. architects, developers, planners, and engineers) and stakeholders (e.g. city agencies, departments, and community groups). The organization of the manuals is geared towards these users, with a heavy graphic-orientation and a clear step-by-step approach. Unlike street standards of the past, the new manuals include renderings and photo-simulations, summary checklists and toolkits, vision statements, clearly defined goals, targeted policies, and implementation plans that detail the roles and responsibilities of stakeholders. In addition to serving technical design needs, they act as education and advocacy tools for the general public. They are designed to be easy-to-use and inspiring, full of images showing vibrant street spaces. 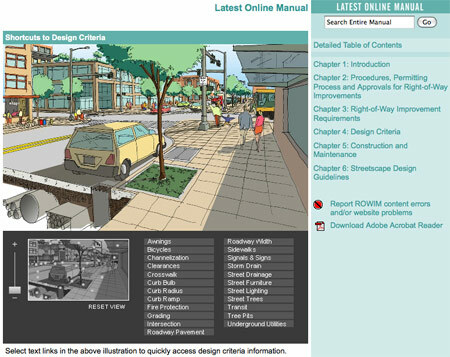 Seattle has an especially user-friendly online versionof its manual to make access easier for property owners, developers, architects, and engineers who are directly involved in the permitting and construction of street space improvements. New York, Chicago, and San Francisco all offer downloadable versions of their manuals online for increased public access. 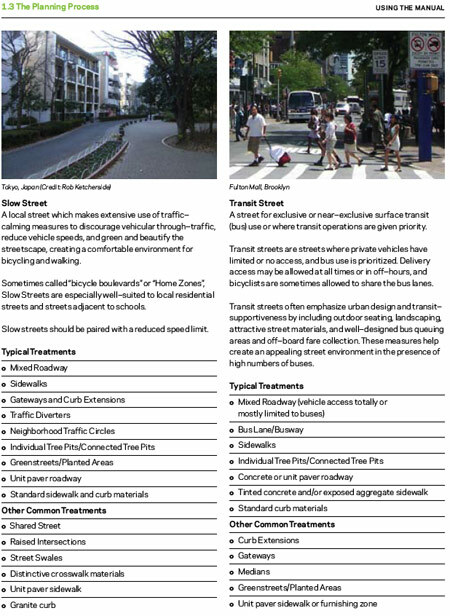 Sample page from New York's "Best Practices for High Performing Infrastructure" showing how the Manual is laid out related to different elements of the street space. The Design Trust for Public Space developed this Plan in partnership with the New York City Department of Design and Construction. Circulation Operations -- both current and future, to make room for public plazas, bus lanes, and bike routes, utilities, etc. While previous street standards emphasized uniformity, the new street design manuals emphasize flexibility and choice for design professionals to arrive at solutions that reflect the needs of each place, and satisfy broad goals that call for "livability," "improved connectivity," and "enhanced environmental quality." To implement the designs, the manuals strive to be as transparentas possible in explaining the decision-making and approval process. A handful of manuals have created flow charts to describe complicated approval processes in more simple terms. The street design manuals of New York and London are two good examples. A page from New York's Manual showing two of their five Street Typologies that include: "General Street," "Boulevard," "Slow Street," "Transit Street," "Pedestrian-Only Street." 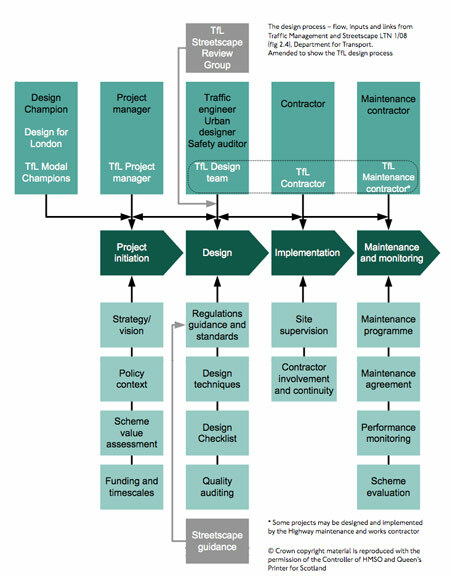 Diagram from Transport for London, breaking down the complicated streetscape design process into a flow chart. Minimization of the roadway to accommodate travel flow, transferring excess vehicle space to the pedestrian. Preferential facilities for bus and bike riders in the form of bus lanes, bus shelters, bike lanes, paths, racks, and lockers. Pedestrian amenities for placemaking such as street furniture and human-scale street lighting. New public spaces with benches, fountains, and vendors. Both San Francisco and New York propose new public plazas in areas previously dedicated to the vehicle as pilot projects. Pedestrian safety features such as curb extensions or "bulb-outs" at corners or mid-block to widen the sidewalk and make crossing easier, visible crosswalks, raised crosswalks, and raised intersections. Environmentally-inspired landscaping like permeable paving, bio-swales, stormwater recapture in tree pits and planters, and climate sensitive plant palates. "Shared Streets" (aka "home zones" or "woonerfs") are low-speed, curbless roadways where vehicles and pedestrians travel on a single shared surface. Common in some European cities, and recommended in New York City's Street Design Manual as a potential pilot project, this design strategy is not widespread throughout the manuals. While Shared Streets encourage the pedestrian-orientation of streets, allow for free pedestrian movement, and reduce the speed of vehicles, the concept is so radically different from what transportation agencies are used to, it is hard for many people to accept. Also, there has not been significant research circulated that looks at its safety, effectiveness, and application. 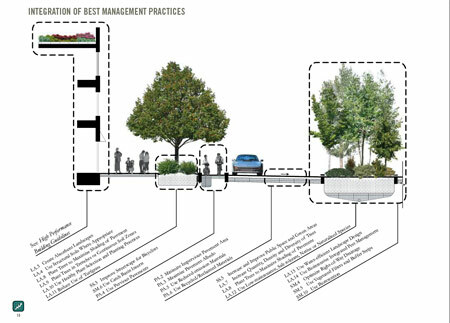 Medians can provide refuge to crossing pedestrians and add landscaping to the street space. However, they also can widen the street space, encourage high speeds of traffic, and make crossing scary for the pedestrians who are stuck in the middle of flowing traffic. Some manuals encourage the design of medians for some streets, while others shy away. 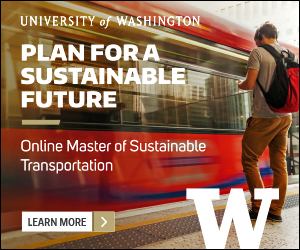 Dedicated busways and dedicated bikewaysseparate buses and bikes from auto traffic. While they improve speed, safety, and reliability of bus and bike travel, they also widen the street and might pose challenges for crossing pedestrians. Some toolkits include these features, while others integrate bus and bike lanes into their typical street sections, in order to encourage slower traffic and sharing of the street space. Roundabouts and traffic circles may have benefits for cities when applied thoughtfully, including: improved traffic flow, pedestrian safety while crossing, aesthetics (through landscaping), and reduction in street approach width, vehicular speed, accident rates, and emissions (with less idling). Installing roundabouts might mean, however, a bigger intersection, a loss of curbside parking, and groundwater utility relocation. While cities are increasingly using roundabouts as preferred design strategies in both smaller neighborhood and larger corridor settings, not all manuals include them. Having an easy to use web interface is helpful for Toolkit implementation. Seattle's interface encourages developers and designers to use the materials, providing a navigable document, FAQs, contact information, a glossary, an email list, and up-to-date revisions. One of the greatest differences between the manuals is the specificity of their implementation and maintenance strategies. Many of the new street design manuals present guidelines, rather than standards; hence, they are without "teeth" to affect real change through code and zoning. For instance, the Metropolitan Design Center's Community Design Toolkit for Building Physical Activity into Daily Life presents principles and strategies, but only as loose guidelines; the Manual does not suggest regulatory and policy changes to make its "Livable Principles" a reality. Los Angeles' Citywide Design Principles are another example where guidelines are presented but not substantiated through regulatory reform. Likewise, New York's 236-page Manual "does not supersede any existing federal, state or city laws, rules, and regulations." 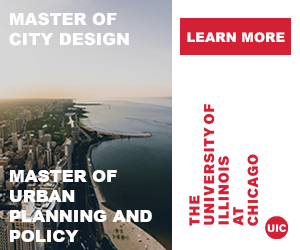 In contrast, other cities have created regulatory manuals in which street design methods and improvements are directly integrated into current zoning and regulation. Seattle has one of the most sophisticated implementation strategies, explaining links to applicable standards and plans, required permits, construction regulations, maintenance agreements, etc. First released in 2005, the Seattle Right-of-Way Improvements Manual has had four years to work out its kinks. It clearly lays out the roles and responsibilities of different departments, and is consistent with all citywide regulatory documents (such as the Municipal Code and the City's Standard Plans and Specifications) and with citywide plans (such as the Comprehensive Plan, the Transportation Strategic Plan, and the Comprehensive Drainage Program). Because most of the street design manuals are somewhat new, we have yet to see how cities and designers will use them. 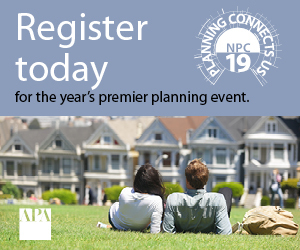 A difficult, but key step is to perform a comprehensive revision of city plans, zoning codes, and development planning documents to make them compatible with the new manuals. In addition, cities must revise their decision-making processes to be more collaborative and inter-disciplinary on a day-to-day basis. This paradigm shift will require both patience and commitment for long-term change. The NYC DOT explains, "the Street Design Manual by its very nature must be a 'work in progress' - its information and guidance will be refined based on evolving best practices and real-world experience with its usage over time." As Mayor Newsom adds, "the Better Streets Planwill not happen over night. [It] will take a concerted effort over time on the part of all of us but will ultimately yield more efficient and attractive streetscapes for the entire city." The next article in the Rethinking the Street Space series looks specifically at process- and content-related challenges that the Manuals face, through interviews with key staff involved in crafting the new Street Design Manuals. The first part of this series looks at why street design matters and where we are today in terms of designing the "street space." The second part of this series review the history of street design and look to the future. Amber Hawkes and Georgia Sheridanare Urban Planners and Designers working in Downtown Los Angeles at Torti Gallas and Partners. 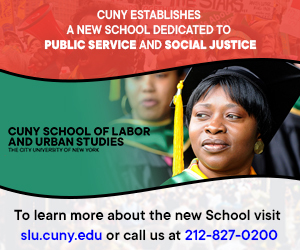 They have lectured at conferences and universities and have worked in a variety of capacities that inform their planning and design work, from behavioral art therapy, social work, and historic preservation, to health law policy, green building policy, and journalism. Thank you to Adam Varat, City Planner and Project Manager for San Francisco's Better Streets Plan for taking time to discuss the City's exciting planning process.